Mesa Culture Media | Innovatek Medical Inc.
Culture tubes of specially formulate soy medium which turn a dramatic yellow when spores grow. Tryptic soy broth gives rapid results in 24 hours of incubation for steam sterilization. Releasat® with soybean casein digest broth gives final results in 72 hours for EO and Dry Heat, and 48 hours for CIO2. 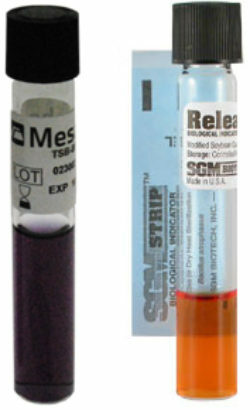 EO/Dry Heat kit contains both Releasat media and B. atrophaeus (10^6) strips.